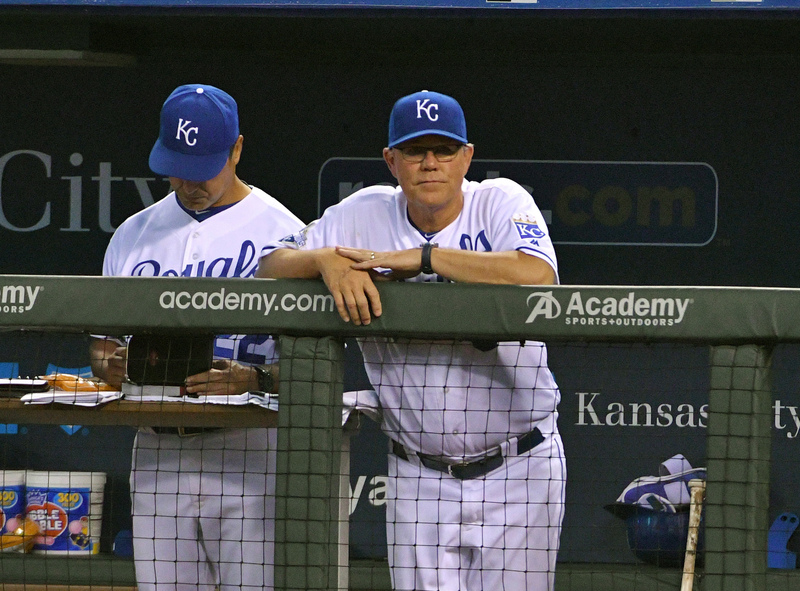 What is Ned Yost going to do? One of the more underreported subplots as the 2018 season draws to a close has to be Yost and his contract situation. He’s in the final year of a two year extension signed after the Royals won the 2015 World Series. Jon Heyman from Fancred reported a couple of weeks ago that the team is interested in bringing back the franchise leader in games managed and won. The Royals plan to offer manager Ned Yost a one-year extension, and they obviously hope he takes it. Yost suggested earlier this year he wanted to keep going, but of course, it’s been a long year (with another rebuilding year or two to go), so there will be a discussion and no guarantee he accepts. In other words, the call whether to continue as the Royals manager is entirely up to Yost. That makes sense. Although the Royals manager is something of a lightening rod for criticism, the job is his as long as he desires. You may not like the way he builds a lineup or manages a bullpen or relies on particular veterans past their prime, but you can’t deny that Yost has the continued respect of the clubhouse and the goodwill of two American League pennants. Don’t forget the loyalty of Dayton Moore. There’s more to managing than just filling out a lineup card and the Royals front office obviously believe that Yost is the man to shepherd the early stages of this most recent rebuild. In order to understand the current situation, let’s look at how the Royals and Moore have handled Yost’s contract in the past. Yost joined the organization in January of 2010 as a special assistant, but quickly took over the dugout responsibilities once Trey Hillman was dismissed that May. A month and a half later, Yost signed a deal that covered the 2011 and ’12 seasons with a club option for 2013. You’ll of course remember that 2011 was the year the high draft picks and the total commitment to The Process began to bear fruit. That was the season players such as Eric Hosmer, Mike Moustakas, Salvador Perez and Danny Duffy made their major league debuts. So let’s start the meter here as 2010 was mostly about salvaging the mess left behind by the unfortunate Hillman era. The Royals won 71 games in 2011 and the Royals front office brass saw enough about how Yost would handle the youth that would form the core of back to back AL pennant winners. When spring training 2012 opened, they went ahead and exercised his 2013 option. It was just a slight improvement in 2012 to 72 wins, but the big jump came in that 2013 season. With James Shields in the fold, the Royals improved by 14 wins to finish above .500 for the first time in a decade. Yost managed that season as a lame duck in the final year of his original deal signed back in 2010. Liking the progress that was made in his first three full seasons, the Royals inked Yost to a two-year deal that was announced at their season postmortem on the first of October. That deal would cover 2014 and 2015. We know what happened there. In fact, the Royals rightly rewarded Yost after the World Series run in 2014 with an extension for the 2016 season. At this point, the contracts and timing of the extensions made perfect sense. As noted above, Yost wasn’t under a long-term contract in only one season of his first three with the Royals. In many ways that 2013 season was a pivotal one in the development of the championship squad. The improvement shown convinced the front office they were close to competing, something that wasn’t conventional wisdom at the time. Although the Royals would never discuss this because it’s well in the past and it involves revisionist history but had that 2013 team fallen off the rails, the Yost contract situation would have given the team options to explore other managers. Once the team rolled through the 2014 postseason, the calculus changed and the balance of contract power shifted to the field manager. After the world championship in 2015, Yost signed another extension, this one covering two years through the current 2018 season. Again, this made sense, even if the length was somewhat surprising to those of us who thought Yost wouldn’t want to invest the time it would take for The Process 2.0. Still, the deserved reward for a title is two years and plenty of job security. So now here we are. The rebuild is well underway and the Royals, despite a strong second half showing, are plummeting to what could be a club record for losses. If the past is any indicator, we should have clarity on Yost’s future with the Royals as soon as Monday, October 1 or thereabouts. Basically, it should be announced whenever the Royals assemble the media for their annual end of the season press conference. The one year where Yost was the lame duck manager, he signed a new deal immediately after the season. The Royals won’t let this situation linger – they would basically be without a manager and in managerial purgatory as they head to another crucial off-season – and I’d bet at this point Yost has a fairly strong idea about what he’d like to do for 2019. According to a report from USA Today published last month, Yost earns $3.7 million, making him the sixth-highest paid manager in baseball. Cot’s Contracts doesn’t have the dollar information available for Yost’s past contracts, but it wouldn’t be outside the realm of possibility to figure Yost earned modest pay increases ahead of his 2015 extension where he certainly cashed in on his team’s success. His current place on the managerial ladder has to do with his longevity and his success. There’s no controversy, nor is there any guesswork. If Yost wants to manage the Royals in 2019, it will happen. Of course, Yost isn’t tipping his hand at this point. It’s difficult to guess what he’s going to do, but I see no signs he’s looking to walk away. The losses have certainly been difficult, but Yost has handled the setbacks as you would expect from a veteran manager. Besides, it’s not like the defeats or the record have been surprising. And as mentioned, the Royals have played better baseball in the second half of the season. They’ve played fun baseball. Yost, more than just about anyone in the organization, has a grasp of the rebuild and how long it will take to return to the postseason. It’s good the Royals are looking to keep Yost around for another season. Sure, some of the in-game decisions and lineups and bullpen choices can baffle from time to time, but it’s clear Yost is trusted by nearly everyone associated with this club. My thinking has evolved to the point where that matters more than any questionable bullpen move. The weird lineups and the bizarre decision to gift 500 plate appearances to Alcides Escobar, the soul crushing bullpen and a struggling early season rotation is more a reflection of the front office than Yost. Looking to point the finger at someone for 100 losses? Given the roster assembled, I’m not sure Yost can wear all those. Much like the 2010 season split by Hillman and Yost, the 2018 season represents the starting line of The Process 2.0. The meter has been reset and now we can gauge success by progress. Let’s see how the youth movement takes shape and how the wins build from here. Yost, from his past success, deserves that opportunity. Will Yost return for more? That, apparently, is entirely up to him. Craig has been covering the Royals at various outlets for 14 years. His work has appeared at various websites, including Sports On Earth, Baseball Prospectus, ESPN, The Hardball Times, and SB Nation. Reach him at craig.brown@baseballprospectus.com. RECAP: Who Is Heath Fillmyer?